The homogenizer (Figure below) provides an alternative solution to the problem of water in high density fuels. It can be used to emulsify a small percentage for injection into the engine with the fuel. This is in contradiction to the normal aim of removing all water, which in the free state, can cause gassing of fuel pumps, corrosion and other problems. However, experiments in fuel economy have led to the installation of homogenizers on some ships to deal with a deliberate mixture of up to 10% water in fuel. The homogenizer is fitted in the pipeline between service tank and engine so that the fuel is used immediately. It is suggested that the water in a high density fuel could be emulsified so that the fuel could be used in the engine, without problems. A homogenizer could not be used in place of a purifier for diesel fuel as it does not remove abrasives such as aluminium and silicon, other metallic compounds or ash-forming sodium which damages exhaust valves. The three disc stacks in the rotating carrier of the Vickers type homogenizer are turned at about 1200 rev/min. Their freedom to move radially outwards means that the centrifugal effect throws them hard against the lining tyre of the homogenizer casing. 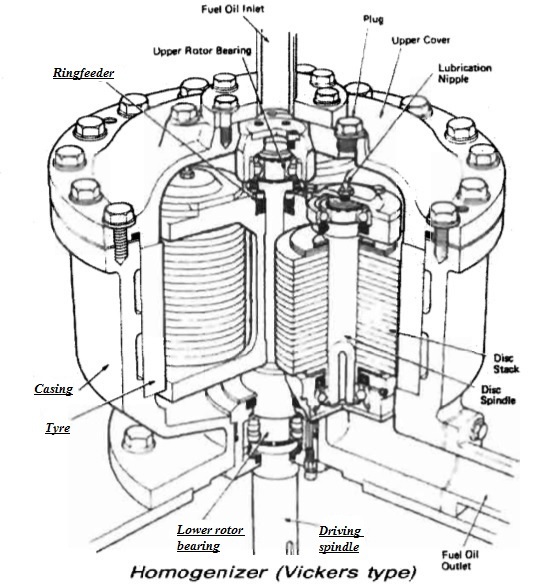 Pressure and the rotating contact break down sludges and water trapped between the discs and tyre, and the general stirring action aids mixing.